Let me preface this by saying that since I joined the Navy, I’ve been in five auto accidents. No injuries have ever occurred, and the police have never issued me a citation in any of these accidents. With that said, I’ve learned a lot from these accidents. This article will walk through each auto accident, and I’ll point out the lessons that I learned from each one. My first auto accident occurred when I was on my first shore duty and I was driving to work. I was driving through an intersection in a residential neighborhood when a woman ran a stop sign and T-boned the front of my pick-up truck. She distracted while talking on her cell phone and didn’t even step on the brakes when she hit me. Which I guess is fortunate, because if she had pressed the brakes, should would have hit me a split second later. This would have meant that instead of crushing my driver’s side front wheel, she would have hit me. We got out of our respective vehicles to survey the damage. My wheel well was crushed, but I was eventually able to drive off. Her Suburban, however, had various fluids leaking out of it and eventually had to be towed. After a while, she walked up to me and said, “I think we probably shouldn’t call the police. I don’t want to get you in trouble.” This brings us to Lessons 1 & 2. Auto Accident Lesson #1: If you want to call the police, don’t let someone talk you out of it. This should be just about any accident unless you both agree that the damage is less than the insurance deductibles. In that case, I’d advise exchanging insurance information and going on your way. Auto Accident Lesson #2: No matter how mad you might be, acting mad isn’t going to make things any better. Accidents never happen when you expect them. Naturally, during the initial moments after impact, your mind is filled with emotions. First, you wonder if everyone is all right. However, once you realize there aren’t any medical emergencies, you instantly think about all the things that roll through your head: will your insurance cover your claim, will I need extensive auto repairs, how much is this going to cost?, etc. Then her temerity in telling me that she wanted to make sure that I didn’t get in trouble? That almost set me off. Instead, I said, “Perhaps you should call your husband and see what he thinks.” By deflecting this decision, I was betting that her husband would guide her to the right decision. She walked off to make a call. About 5 minutes later, she came back and said, “My husband thinks we should involve the police.” Great idea. We called the police and traded insurance information. I was able to drive off, but her truck had to be towed. As I was driving away, I noticed the police officer writing her a ticket for failure to yield right of way and running a stop sign. 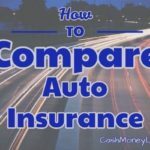 Learn a little about the different types of auto policy coverages here. Auto Accident Lesson #3: No matter what, do not say anything that is unnecessary. Let the police (if necessary), insurance companies, and everyone else figure it out. But don’t contribute to the speculation. I pulled him aside and said, “Listen, kid. Don’t EVER, ever, admit any liability. Ever. Even if you caused the accident, don’t say a word.” I then told him that there are unscrupulous people who will try to take advantage of the situation by claiming fake injuries or exaggerating the amount of damages. We exchanged insurance information, and I got my second insurance payout. It was $1,500 to repair the fender for a then-nine year old truck. I cashed the check and never fixed it. Sometimes it’s better not to repair your car if you can live with the cosmetic imperfections. All right. I wasn’t really driving..I wasn’t even in the car. But since it totaled both of our cars (yep, a two-fer), I’ve got to tell this story. Accident #3 happened while Tania and I lived in Norfolk. We had bought a cute little house behind Old Dominion University, which was on a corner lot. We did have a driveway-type area, but never used it since it involved opening and closing a chain-link gate if we ever wanted to use it. Instead, we had street parking. We had gone to bed, and both of our cars were lined up behind each other right outside our house. At approximately 0430, we woke up to a huge crunch. Although I was sleeping in my boxers (let’s keep that intimate secret just between us), I immediately ran outside to see what happened. When I got out there, I saw a yellow Jeep. It was clear that the yellow Jeep had hit our cars. I tried to flag the owner down, but he drove past me very slowly. As the driver approached the stop sign on our corner, he tried to turn right. After the jeep jumped on the curb, it became apparent this driver was impaired. I wasn’t sure if he was drunk, or if the accident caused an injury. However, I was able to jog up beside the driver’s side, wave him over, and get him to put the Jeep in park. That was when I noticed the spider web on the windshield. Apparently, whatever collision (which I hadn’t had the opportunity to check out yet) occurred caused his head to collide with the windshield. It didn’t help that he wasn’t wearing his seat belt. Once he pulled over, I was able to convince him to turn off the Jeep, give me the keys, then sit on the curb. We sat and talked until the police (which Tania had called) came and started questioning him. I then had the opportunity to go inside, get some shorts on, then look at the vehicles. What had happened was that this young man was driving down our street, side-swiped my truck, bounced off and veered towards the median. He must have seen that he was headed for one of the trees in the median, so he steered back towards the right-side of the road. However, when he did so, he over-corrected and slammed into my wife’s car. Both cars were totaled. Tania’s car was not drivable, since the frame was bent. However, since my truck just racked up more cosmetic damage (about $2,000 worth), I continued to drive my truck for another 18 months until we moved overseas. This is where it’s good to know the value of your car and whether it makes sense to have full coverage or just liability only insurance. Auto Accident Lesson #4: Do not drink and drive. I was going to a conference that day, so I was sleeping in. Had I been going on my normal commute, there’s a good chance that I would have been getting into my truck at the time of the accident. Not only that, but this young man ended up going to jail. Although I was deployed by the time he went to trial, I heard that this was not his first incident and that he did serve some time in jail. Auto Accident Lesson #5: You might be dealing with someone trying to flee the scene. While it was relatively easy for me to get this person to pull over before he caused more damage, you might not have that luxury. If someone causes an accident then leaves, you should at least try to get the make and model of the vehicle. If you have a smart phone, don’t try to memorize it… just get your phone out and take a picture. Make sure to include the license plate if you do. If there are witnesses, see if one of them will stick around to back your story up to the police. In case you needed a reminder, this video is an excellent first-person account of one man’s DUI experience. This accident stings me the most, since it’s the only one that my insurance company had to pay out for on my behalf. It happened this past April. I had just gone to see my mother, who was in the hospital. I was on my way home on a very busy Tampa street. An SUV in front of me suddenly stopped, I was boxed in, and I bumped into the back of him. Plain and simple. Turns out he had hit the car in front of him, and came to a much more sudden stop than I’d expected. We all pulled over, police were called, etc. I know that there weren’t any brake lights that went off. If I’d seen brake lights, this might have made a difference and I could have stopped behind him. He had a trailer hitch. This probably caused about $1500 in damage to my grill. My fender-bender went from being a bump (on my end) to being a covered event. The first person’s story sounded like the beginning of an insurance scam. None of this mattered, because at the end of the day, I still had liability. Let me explain a little more about the accident, which involved three cars. Car A is the front car, Car B is the car in front of me, and I’m Car C. Car A came to a sudden stop, Car B slammed into him, and I hit Car B. Fortunately, there was no Car D.
Auto Accident Lesson #6: As much traffic as there may be, the rules of the road still apply. Knowing that Driver A might have been trying to pull an insurance scam, or that Driver B had a trailer hitch and that his brake lights didn’t work (my assumption is that he just didn’t brake) is all well and good. But, I should have had that extra car length for braking distance. Auto Accident Lesson #7: Be aware of a possible insurance scam. There are many people who might try to manipulate insurance liability to get a quick payout. Fortunately, there was a police officer who was able to stop the conversation in our case. However, that’s not always the situation, and you need to be aware of possible scams. If your spider senses start tingling, you might want to have a police officer come out, or at least call your insurance company for assistance. Watch this video to learn more about car insurance scams. This accident is fresh in my memory. It’s so fresh, I haven’t even gone car shopping for my replacement vehicle yet. I was driving to work, down a pretty busy 2 lane street in South Tampa. When I came around a reduced visibility curve, I saw a lady in a Jeep SUV was at a stop sign to my right, trying to make a left turn. I saw that she was trying to pay attention to an oncoming car that was making a left turn. When that vehicle made its turn, she pulled out in front of me. While I tried to move to the left, she accelerated into my path and I struck her front end. This was probably the most serious accident… it’s the only one where my air bag has deployed. It was the loudest collision. Also, it’s the one accident where I really worried about the other person’s safety. There was absolutely nothing I could do to avoid this accident. As soon as the other person’s car was in front of me, I knew that all I could do was mitigate damage. Fortunately, there were no passengers, and the other person was all right. There were a couple of eye witnesses who corroborated my story and agreed that I was going the legal speed limit. There was no question of my liability at all. Police showed up, a wrecker took away both vehicles, and she got a ticket. Insult to injury: my car had come to rest next to a power line pole. My driver’s side door was resting on one of the cables. When the wrecker pulled my car out, he ripped off my driver’s side mirror. That probably didn’t total my truck. The crushed front end (recently repaired, that is), busted radiator, bent frame, smashed rear passenger’s side door probably did that. But it didn’t help. My little bonus was I got a ride to work in a cop car, where among other things, we talked about police laptops. The police officers pick up on the irony. They have to enforce distracted driving rules, but get all of their calls through a laptop. A couple of things here. Auto Accident Lesson #8: Just know that mitigating damage might be your only option. Brace for impact. That lady was about 5 feet lucky. I say ‘5 feet lucky’ because my truck completely smashed her front end. If I hadn’t moved to the left to try and avoid her, I probably would have crushed her. Auto Accident Lesson #9: Eyewitnesses count. A lot. When you’re in the middle of an accident, there’s a LOT going on. It is easy for these events to overwhelm you. During the process, you’ll never be able to keep up with everything, and there are a lot of important details that you may overlook. If you’re an eyewitness, however, you might pay more attention. I think it’s because people have an innate desire to tell stories, so eyewitnesses track a lot of details to make the story more compelling. Most eyewitnesses usually don’t have an agenda, so they’ll tell the truth. Auto Accident Lesson #10: Make sure you have your insurance information and registration IN THE CAR. The other person didn’t have her insurance information with her. Fortunately, she lived nearby and her husband was able to bring it out to her. If she did not have her insurance card, the police officer would have given her another citation. Fortunately, most auto insurance companies have apps that allow you to prove your insurance coverage, even if you don’t have the card in your glove compartment. No matter how many accidents you’re in, the sound of collision never gets easier to hear. Hopefully, you never have to hear that sound. If you’re able to remember some of these lessons, dealing with the aftermath should be a little easier. Scary stuff, Forrest! I’ve been in a few fender benders. Thankfully, none were serious or involved injury. One was my fault (high school; I pulled out in front of another teen driver). Thankfully there weren’t any injuries and the damage was slight enough that we didn’t need to involve insurance companies. But it was a wake up call! The other couple fender benders weren’t my fault. I made sure to call the police both times. I also drew a detailed description of the area, flow of traffic, and the events as they occurred. The insurance companies told me these diagrams were very helpful in assessing the claim. I didn’t have a smart phone back then. So now I would augment that with images taken at the scene. I would always err on the side of having too much information rather than insufficient info. Glad to hear there were no major injuries in any of your wrecks!